Good news for School Information System obsessives like myself - I've got hold of some newish data on English market moves from the past year. There's lots to report. But first, a quick word on the data source. 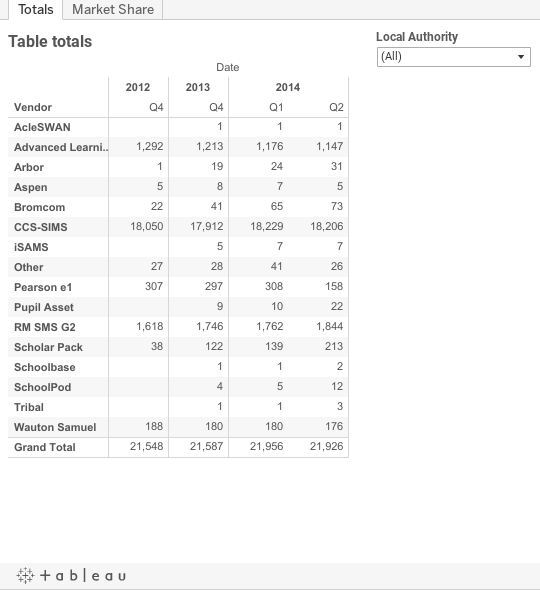 It turns out that the DfE have now agreed to circulate raw data on MIS market share to vendors, and one of them has been kind enough to share the 2014 files with me. In preparing this analysis I've therefore combined these new datasets with the 2012 and 2013 autumn census information I used in my previous blog on the same subject. So, as last time, here's the data in Tableau for you to play with, followed by my take on the main headlines. Looking beyond SIMS, there are two obvious winners and one big loser. RM (1,844 schooks; 8.4% market share) and Scholarpack (212; 1%) will be the ones celebrating - they've each added close to 100 schools over just two terms. In the case of Scholar, one reason for the rapid growth is that they seem to have worked out how to win a big local authority contract. You can see this from the above tables: go to the "totals" tab and filter for Cumbria LA. You'll see Scholarpack now have 106 schools in the region. Most of those schools switched away from SIMS. So while SIMS look secure for now, that could change rapidly if more LAs start to see insurgents like Scholarpack as a viable alternative. Advanced Learning (1,147; 5.2%) are once again the big loser. They've shed another 66 schools over the past two terms. And don't forget these figures represent combined sales from their legacy product (Facility CMIS) and their new cloud offering (Progresso). 139 schools also moved away from Pearson (158; 0.7%), but seeing as they're no longer even supporting their product, if anything the surprise is that 158 schools are still persisting with the software! What of the smaller pretenders? Well, it's mildly surprising that Arbor (31; 0.1%) aren't gaining market share faster - it feels like a lot of people are talking about them, but this this isn't yet flowing through into significant sales. Bromcom (73; 0.3%) picked up a creditable 32 schools over the two terms of new data, but like Arbor, they haven't yet managed to break into three figures. Pupil Asset (22; 0.1%) are emerging as one to watch - they are selling a MIS off the back of their primary assessment tracking software, and this "upsell" strategy seems to be bearing fruit. iSAMS and Schoolbase are both strong in the independent sector, but they're not really getting any traction in the state sector yet. And spare a thought for Tribal (3; 0.0%) - they're big in university MIS, but after two years of plugging away their school system (Synergy in Schools) is struggling to sell to anyone. A final thought: I do think that commissioners (like academy trusts and local authorities) can play an important role in increasing competition in the marketplace. For example, they could structure procurements in a way that creates room for more than one vendor to share the business. After all, there are more and more ways for commissioning groups to aggregate data from multiple schools without them all being on the same system (e.g. by using products like Groupcall Xporter and Zinet Connect). Ultimately, if purchasers want to see more innovation, they have to create a procurement environment that allows smaller vendors a fighting chance.